Verdict of the jury composed by Alfredo Aracil, Jaime González Cela, Manuela Pedrón Nicolau, Violeta Janeiro Alfageme and Catherine Haggarty, Danny Lamb, Jane Hayes Greenwood, Sebastián Roselló, Violeta Mansilla and Ivan Cicchetti. Selected artists have a period of 5 calendar days to accept their place. After that period, if there are free places, the following will be selected from the next waiting list numbered from 1 to 6, and the final list of resident artists will be communicated again on the website on June, 5th, 2018. Many thanks to all who have applied for this call. Being a self-financed Residency only by Espositivo, with the inscription fee you are contributing to make this possible. Regarding the III Call for Residencies 7B, Espositivo is pleased to collaborate with Catherine Haggarty (Ortega y Gasset, NewYork), Danny Lamb (Painterspaintingpaintings and Rod Barton, London), Jane Hayes Greenwood (Block 336, London), Sebastian Rosselló (Galería Alegría, Madrid) and Violeta Mansilla (UV estudios, Buenos Aires). This program is addressed globally to artists, commissioners and researchers that want to develop a project in Madrid. 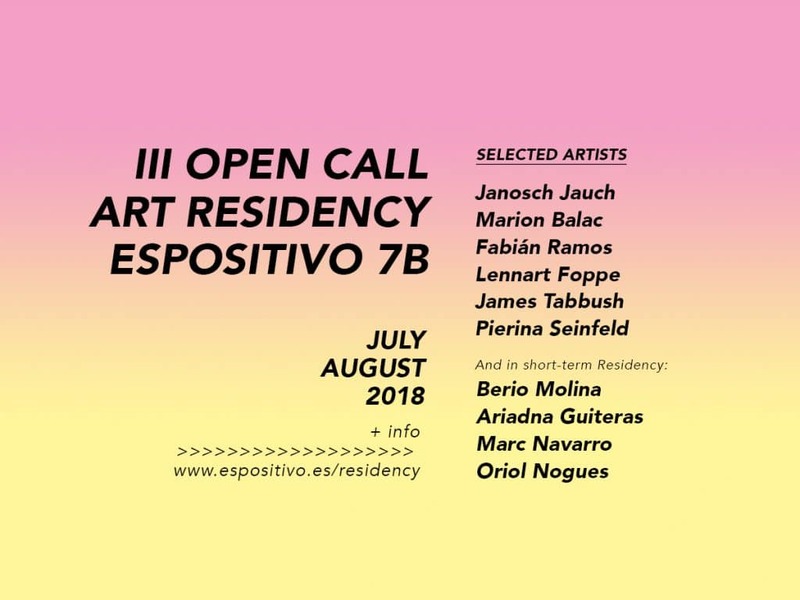 Espositivo 7B aims to connect artists/curators that go through the program with other like-minded artists/curators whom are living in Madrid and promote them using Espositivo’s own contacts and networks. Furthermore, the residencies offer oversight and guidance on their projects with the help of the curators Alfredo Aracil (Buenos Aires), Jaime González Cela , Manuela Pedrón Nicolau and Violeta Janeiro Alfageme, as well as the Espositivo Team. Espositivo was founded in 2014, with the aim of spreading and support contemporary artistic creation. Residency Calendar: The applicants whose projects are chosen to be exhibited, will be notified between the months of July and August 2018. Apartment Details: Espacio 7B is an attic located in the city center of Madrid (Bilbao metro). The apartment includes three bedrooms, two bathrooms, a kitchen, a laundry room, a large living room and a bright studio space. The exhibitions that we organise are located at the Gallery adress: Espositivo, calle Palafox Nº5, or in one of the collaborating spaces both in Spain and in the rest of the world. This summer, from July – August 2018, we will assign a total of 6 residency spots, which includes both: accommodation and the space to work for 29 days. In the end, the selected artists will offer one of their works (chosen together by the artist and Espositivo) that was created during the residency to Espositivo or they can opt to collaborate in a project with Espositivo and/or one of the collaborating curators. In the event that, the artist becomes represented by a gallery through the use of Espositivo’s contacts and networks, the distribution of the percentage of money is as follows: the artist will be entitled to 50% of the total sale, Espositivo will keep 40% and the remaining 10% will go to your gallery. If the artist is not represented and a sale is made by a direct contact of the artist, Espositivo will keep 10%, while the other 90% will remain intact for the artist. Selected artists commits to mention in all public communications of the project carried out during the period of the residency the support received by Espositivo and they shall include the logo or name of the space in all their publications. We want to remind everyone that Espositivo is a NON PROFIT organisation without any kind of support from private or public sponsors, and carries out the residency program solely to create links between national and international artists, cultural managers, curators and gallery owners. The money that is generated through these possible sales will serve as a mean to continue building a space in Madrid that is conducive to artistic creation and cultural development. Specifically, we will use the funds so that other artists can enjoy the residence in the future, develop the program throughout the year, improve the structures, remunerate the cultural agents who work with the artists, and organise outings to other cities and activities during the residence. In either case, the works will be sold before the 27th day of the residency, when it will be decided jointly if any of these will be used for a project in Espositivo or another center. Espositivo has a sole right on the works for 40 days after the artist’s residence. During this period Espositivo will disperse the works among its contacts and/or assign it to future internal projects or with external curators, galleries, or collaborating spaces. The residence does not include travel, food, or materials. We encourage all participants to look for private sponsors (galleries, collectors, etc.) or public aids to cover the remaining expenses, If needed, Espositivo can provide the necessary documents for these sponsors. The residence does not include health insurance either. Candidates not residing in Spain must have medical insurance during the period of residence. We do not process visas but we will gladly make a letter of invitation to the chosen artists if they request it. The selected residents must commit to developing their proposed project and present it by the stated due dates and times. They must keep the space which is granted to them clean and leave it as they found it (otherwise, they will have to assume cleaning expenses +/- € 25). Most importantly, selected residents must act with respect and integrity towards their other fellow residents, curators, and with the entire Espositivo team. A mandatory 50€ deposit will be made by each residence artist that will act as insurance towards distributed materials and supplies. The 50 euro will be returned to all residencies at the end of the stay, as long as all the materials and supplies are returned without damage. To participate in the program, interested artists must pay only a registration fee of 15€ (does not include taxes or bank fees), without further costs. The deadline to submit applications is May 21, 2018 at 11:30 pm (Madrid). Both individual and joint projects are welcome to be submitted with up to a maximum of 3 people per project. The participants have to send the documentation by email to ivan@espositivo.es, indicating in the subject ESPOSITIVO 7B. This email must contain a single PDF document whose title is the name of the applicant and/or applicants. 1. Contact details of the person responsible for the project. 2. Number of people who will participate in the residency. 3. A proposal for which residency program dates they are applying for. If alternative dates are presented, the possibilities of admission are greater. 4. A signed letter that states that the artist commits, if elected, to fulfill all duties of the residency by the specified dates according to the agreements and conditions of the program. 5. A description of the project that will include the necessary spaces for its completion. 6. A brief resume and portfolio of recent artistic projects or web links where we can visualise your work. The second selection will include 6 selected resident artists that carried out the program during the months of July & August. An additional 6 selected resident artists will be put on a waiting list. The website will show a list of the 6 selected chosen projects, and the 6 selected for the waiting list. All those selected have a period of 3 calendar days to accept their placement. After this period, if there are free places, the next will be selected from the waiting list numbered from 1 to 6, and the definitive list of resident artists will be published again on the web page on Friday, June 1, 2018. All participants are held subject to the terms and agreements of the project.